Over the past few years, eyebrows have become a bit of a 'thing'. I think it was started by supermodels sporting the bold brow look and since then the world has become brow obsessed. Phrases like 'I won't leave the house without my brows on', 'brows frame the face' and 'brows give the face more structure' have become more and more frequent but I have to say, I agree with all of them. 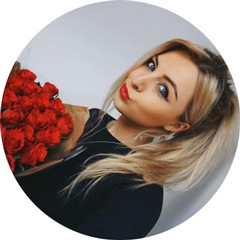 Brows really do make a huge difference to someones face - you'll know what I mean if you've ever seen that funny photo of celebs with no brows (how bizzare do they all look? ), and they make an even bigger difference if they're perfectly groomed and defined. When I look back at old photos of my teenage self, I have to say I cringe a LOT at the state of my eyebrows. Overplucked, sparse and uneven are just a few of the things that were wrong with them. I went through that awkward teenage stage where I thought it'd be cool to pluck them myself (not a good idea!) and was left with two thin lines of hair. I think I actually shaved a line in one of them as a dare once too - dear lord, what was I thinking. Anway, embaressing brow history aside, my brows are now looking more acceptable. They've re-grown, have a shape and are nicely groomed. I'm still not 100% happy with them but there's a few products I use on a regular basis to ensure they're looking the best they can. When it comes to grooming eyebrows and getting into a routine, I'd really advice leaving the initial shaping to a professional. They're more likely to know what shape will suit your face and they can make sure they're even as well as trim any long hairs so they're easier to fill in at home. It doesn't make a great deal of difference where you get them done, as long as they're reputable. I've paid £30+ and £5 at different places and never seen a difference in the quality so don't be fooled into paying a fortune. After having them shaped, its important to maintain them at home and keep on top of re-growth. To do this I make sure I brush through them with these Ebay disposable spooley's to ensure all of the hairs are facing in the same direction (this also helps with growth too as it stimulates the hair follicle) and then I apply Rapidbrow eyebrow enhancing serum which has seriously helped my brows grow back much quicker and fuller. I'll be doing a full review on it soon so keep your eyes peeled for that. I then keep on top of any stray hairs with my Shavata pointed tweezers which are super sharp and get every teeny little hair. They're quite difficult to use at first as they're so pointed but when you get used to them, they're fab. My favourite product for filling in my brows and creating a defined shape is the HD Brow Palette in the shade 'Foxy'. I must prefer powder over pencil as I feel it creates a more natural look. The palette comes with four shades and the shade in the bottom left hand corner matches my brows perfectly. Its a dark brown with a slight ash undertone so it doesn't give my brows an orange tone like some other brow products do. I tend to use the other three shades in the palette as eyeshadows but you can mix and match them to create your perfect shade too. 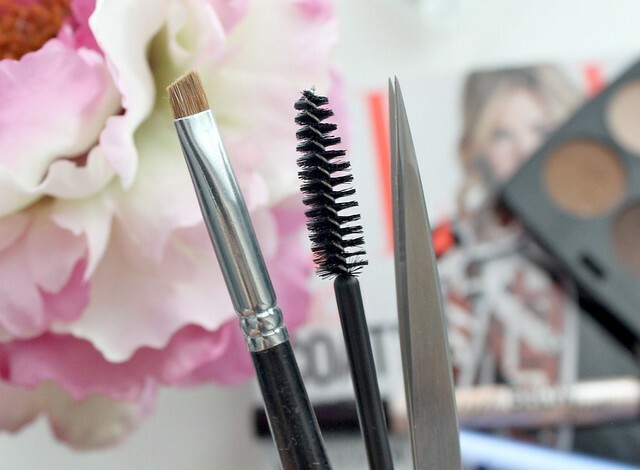 To apply the powder to my brows I use the Crown Brush C160-1/8" Angle Liner brush and considering its so cheap at less than £3, its made a massive difference to my brows. Applying the powder with the brush has allowed me to have more control over application and helped me to create a better shape in general. The angled edge allows me to get a really precise line and when turned and used on the side its great for blending and creating a faded effect at the front of my brows. A couple of extra products which aren't necessarily essential but nice to have all the same are the Benefit Gimmee Brow and Benefit High Brow. The Gimmee Brow is great to use if you're having a 'no makeup makeup' kind of day or if you're already happy with the shape of your brows and just want to add a touch of colour and volume. Its also great for setting brows in place too, much like an eyebrow gel or wax. 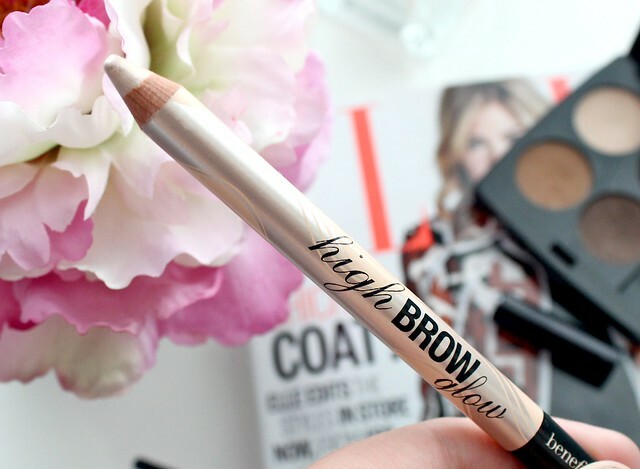 The High Brow is a product I've only just recently received but I love it already so had to include it in this post. Its a champagne toned highlighter pencil that's designed to be used on the brow arch which is perfect for me as I love adding highlight under my brows - it helps them look more defined and polished. I've also been enjoying using it in the inner corners of my eyes to open them up. So there we have it, my top products for keeping my brows nicely groomed. As I said earlier, I'm still not entirely happy with them but these products have definitely helped me achieve something that resembles a well groomed eyebrow instead of a sparse thin line. Yay!! With a bit of patience waiting for them to thicken up, willpower to avoid the tweezers and regular trips to the beauty salon, I'm sure they'll be rivalling those of Cara Delevigne in no time. 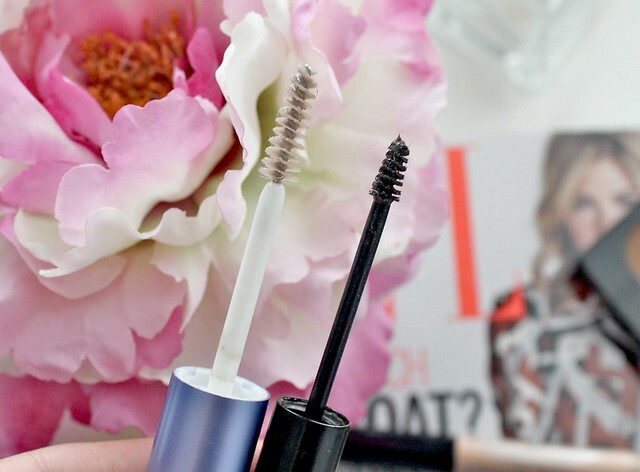 What are your brow must-haves? Do you have any top tips? Great post! I'm also obsessed with doing my brows- it really does give so much more structure to the face! I want to try the HD brows palette now ^^ My fav' for my brows are the Dior pencil and MAC Coquette eyeshadow. I just finally got around to grooming my eyebrows- we were super overgrown - and now my brow routine has totally changed, and for the better. Haha. I love to use a Maybelline eyeshadow for my brow color. It is just super accessible. Use a brush to apply, add a coat of brow gel and then I'm done! I love keeping them looking their best, Its probably my favorite part of doing my makeup, next to doing my base. Love the HD Brow Palette, I know I cringe a lot at my past brows too i never would have thought that brows would be so important to me! Gimme Brow has been on my wishlist for a while now, it sounds great! I love seeing what products people use for their brows! The palette is gorgeous, I have that in-between blonde and brown hair colour that allows me to do my brows the same colour as my hair or a few shades darker and for it to still look natural, so I'd definitely love to pick up something with such a huge shade range so I could experiment more. I havent ever used a clear mascara or brow product similar to set my brows though. I may have to look into that! Need to try high brow - keep hearing such great things!! Must try out the HD brows pallet! I love reading posts about brows. Thanks for sharing this! 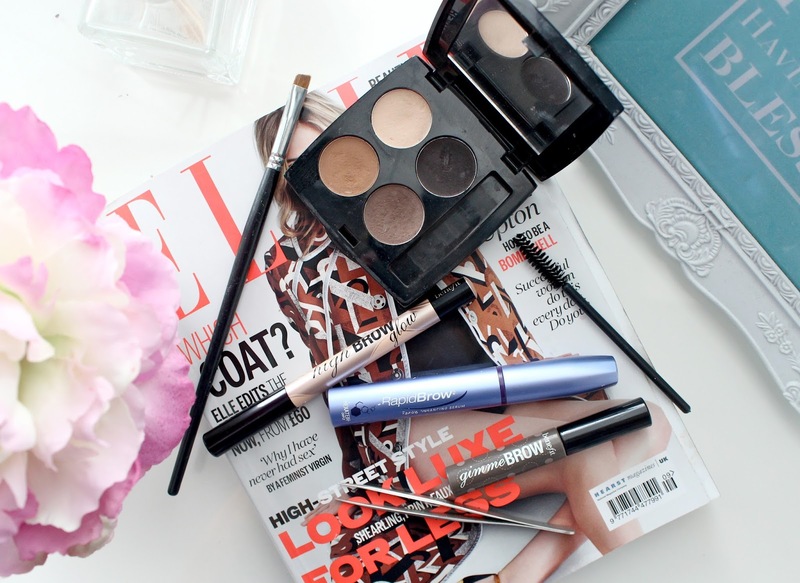 I'm so bad with my brows so I needed to read this (and catch up on my fave blog!!! ), I find it so hard being blonde and having to do brows, I just feel so rubbish at getting the shape right. I have those tweezers and LOVE them once you get used to them! Oh teenage eyebrows, yikes that does bring back some cringey memories! Sleek have got a great brow palette as well that;s worth checking out. I really want to try the Gimme Brow! Really want to try the Benefit High Brow, I love highlighting that area as well and this looks so pretty.